If you were to draw up a list of essential ingredients for the perfect pub what would it include? I imagine a fine selection of beers has to come pretty close to the top, including some guest ales to tickle the taste buds, and give opportunity to any CAMRA pin badge wearers amongst you to exclaim, “Ah yes, cracking little brewery that…” or, “Mmmm…. You can really taste the hops in this one”. And how about some outdoor space to enjoy this in? 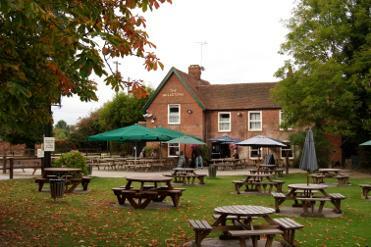 The term ‘beer garden’ is loosely used in this country these days, encompassing anything from a 4-acre lawn with boules green, children’s play area and numerous awning-draped benches to a pair of wonky stools underneath a converted bus stop that just so happens to be within three paces of the front of the pub. A proper beer garden though, with grasses, tables and willow trees rippling the gentle flow of a meandering river, would surely be high on the list for a perfect pub. And what point the beer garden of Eden, if disturbed by the incessant rattle of freight or the constant descent of holiday-makers overhead. It should be serene and undisturbed. But all these things can, theoretically, be true of a chain pub. The perfect pub needs history and individualism, an identity that makes it instantly memorable. Perhaps the pub used to be a mill, for example. And within said pub, wouldn’t it be amazing if the original waterwheel and millstone were still intact three hundred years on, with the stream still channelled through the building, offering a fascinating glimpse into the life of the buildings; the sounds, the smells, the people and the sweat that once occupied the space. That would make for an memorable pub indeed. Given all this, the perfect pub would probably have to serve some decent food, as you could be there a while. Traditional pub fare or lumps of meat and yards of fish perhaps, or smorgasbords of meat, bread and olives for people who like to ‘share’, or even something from the cheese menu, sir, if one would like. Surely though such a pub can’t exist. Or certainly not within striking distance of London. This sounds like a mythical inn from Narnia or The Shire? Such a pub does exist and, although I’m not aware that Basingstoke was inspiration for either Lewis or Tolkien, even their imaginations would find it hard to best The Millstone.